The new motorcycle draws on skills and experience from experts not just within the company’s motorcycle division, but across its aerospace, gas turbine and other many other high technology manufacturing disciplines. 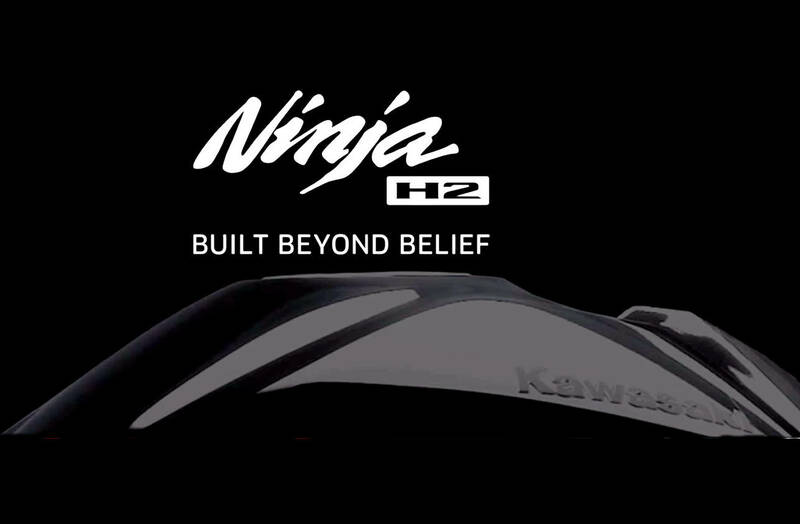 Harnessing the power of the Kawasaki manufacturing group as its “collective strength,” the new project has been evocatively named the Ninja H2. Kawasaki is anticipating huge international interest in the H2, which represents a unified approach in engineering and state-of-the-art technology. It captures the spirit of the 1972 750cc Kawasaki Mach IV H2. And, along with its predecessor, the 500cc three-cylinder H1, as well as the all-conquering 1972 903cc Z1 Super Four, these motorcycles epitomized Kawasaki’s performance image. They would also define the modern sportbike market as we know it today. The 2015 Kawasaki Ninja H2 project will add yet another name to the roll call of machines that embody Kawasaki’s engineering and performance expertise. And it will undoubtedly change the motorcycle landscape forever. Well, it will not be a ZX-14 replacement, since we still can buy it in 2015. The ZX12 had its last model in 2006, due to bean replaced by the ZX14 in 2007. I’m betting in a 900/1000cc supercharged four cylinder. This is not a turbo bike. It is supercharged. Turbos don’t wine like that nor when down shifting does the bov chirp. As far as displacement I would be sad if it is anything less then 1000cc. (999 or 998 cc whatever) most likely it will be a middle weight of at least 700cc. I hope not tho. I had a 2011 zx10 and have a 2012 zx10. These are no longer powerful enough for me. I am looking to turbo my bike as we speak but the fab work will cost 5k. Plus all the parts and tuning would be close to 8k. Not really feasible. So please let’s all hope and pray that this h2 is a 1000 so we can actually get the 200whp we’ve all been dreaming of. Nothing new could be had in the superbike arena that is not already there. I would think and hope they invest in the smaller CC market with an inline 4 turbo 300cc superbike. LOL…good luck with that. Also, who makes a 750cc supercharged bike from the factory already? That is what speculation here is. It is a mid-sized engine with a previously unheard of power-to-weight ratio. I’m pretty sure the frame will be good enough to keep the engine on the road instead of being relegated to a chainsaw (the H1 and H2 engines work incredibly well in this application). I think it will be a 14 R with a charger on it ! I bet on a 3 cylinder supercharged, 650 to 800cc. A supercharged in-line 900cc four with pneumatic valves……. pneumatic valves are prohibitively expensive, and delicate to contamination, this would not be a viable item in production motorcycle, me thinks. why 900cc? Label! All for $8,000. That bike would change the landscape more than a bike with 200 hp and ugly styling. Isn’t that the Versys 1000? I won’t be impressed unless it has a flux capacitor and does time travel. For $10,000. plutonium 235 space modulator @ each cyl. love to see 2-stroke…just hope its not some electric/battery piece of…. H1 and H2? Wicked but frames made out of licorice I think, went like stink but couldn’t steer or stop it. We put an H2 in a go cart and you could wheelie it (we used a couple leaf springs for wheelie “bars/spark maker”). Couldn’t steer or stop it either. Sure hope this is NOTHING like those two bikes. Looks like a 4-stroke triple, dohc, with a supercharger. I doubt it will be a hybrid too. Good for Kawasaki. This childish ‘ninja-turtle’ thing is unfit to true motorcyclist’s world. Why not to go back and call it Mach 2, 3, 4 of whatever seem to make better impression. Just NOT Ninja! BTW, I was one tine a big fan of their triples and actually owned the cutes of them – the KH250. Sweet, although bit heavy little cat. My own son rides Ninja 300; he is 25. That’s partial excuse. NIce, tight flexible frame, tremendoous fuel consumption and a reputation for killing owners. Yeah, bring back the H-2! Kawasaki used a lot of the same hyperbole prior to the introduction of the ZX-12R in 2000. Same references to cross-corporate-division synergy, aerospace, blah, blah blah. Remember how it was going to be a game-changer? Not that the ZX-12R was / is a bad bike – I fell for the hype and bought one in 2000 and still have it! – but it wasn’t any great leap forward in motorcycle engineering or design. Anyhow I’m throwing my $0.50 in the pot, guessing this new one is a supercharged triple 4-stroke, 750cc. On the latest sound clip you can clearly hear the sound of a wastegate activating. That’s a four-stroke four obviously unless the Big K is throwing a curve ball? I think you can hear the Blow-off valve, not the wastegate. right then, since those bikes were one of kind and really can’t be duplicated, why not advance the lineage and call this an H3…? I mean, you’ve gotta know you’re setting the bar PRETTY FRIGGIN’ HIGH by calling it “H2”, and if you don’t live up to the hype…? well, you can only expect to be CRUCIFIED…!!! and to a certain degree, they (the masses) can’t be blamed since the responsibility of “managing expectations” falls to squarely on their shoulders. but it’s able to reach Mach2 speed… enough to brag for a good .001 seconds prior to die..
Oh yeah. Pretty sure this will be a triple! A 500 CC triple would be awesome. Bring it on. Has anyone took note they said the gas turbine division is involved? Just taking a guess here, but unless it has a super or turbocharger, or, not likely, but an actual gas turbine engine, why would that division be involved? Gas flow and the supercharger. That is what I thought as well, a high performance hybrid motorbike. Electric seems to be the trend.. Thanks Mr. NG I know a lot for destroying my morning productivity…..
Or it might just be another beaked adventure bike. Kawasaki has always relied on the (engine) performance of their bikes as their marketing edge. That has not played to a deaf ear by any means but there have been examples of some of their models in the past having speed and power above frames and suspension to keep those horses controlled well. I’m am so far from caring who’s king of the street and would rather see Kawasaki finally get into MotoGP and duke it out there. Obviously they’ve felt heat from BMW, Aprilia and Ducati on the street so it’s time to “reassert” themselves. How ’bout it Kawasaki, why don’t you put your engineers to task and pit them against the best the others have? finally…? well they’ve come and gone. have since told Ezpelata to pound sand. Kai Ju, I thought the exact same thing! A direct-injected two-stroke would be a good thing IMHO. Your cracking me up Kevin. They were horrors, crap brakes , crap suspension, crap frame, but a great motor! We used to call them “Death Machines” also. And the early ones had no kill switch. And the ignition switch was on the left side below the seat, so it was hard to reach while you were underway. The slide-needle carbs were prone to sticking wide open when you pegged the throttle (that’s how the first owner of my bike died). Without a kill switch and traveling at high speed, if the throttle stuck, the way to survive was pull in the clutch and kiss the engine goodbye. Torn as to whether I should take this here pellet gun and shoot my eye out now..? Or make a beeline for my nearest Kawasaki dealer..? Please shoot both eyes and anything else you can hit. Yeah, my first bike was the white tanked 1969. My parents bought it for me – they had no clue. The white crash imprint of the tank under a freeway bridge is there to this day. “Kawasaki Claims the 2015 Ninja H2 “will undoubtedly change the motorcycle landscape forever”” Not by rehashing a 42 year old bike. I’m sitting on a tree limb busily sawing away at the point where the limb joins the trunk. This bike will be hydrogen powered. My guess: a blown, direct injected, 750cc triple 2-stroke. The engine will be light enough to substantially reduce the weight of all other components, resulting in new standards for power to weight ratios. That’ll make for a super light and powerful sport bike with all the advantages light weight brings. That isn’t fair, it’s the fantasy of Mila Kunis slipping me a Viagara Roofie. Put it in a streetfighter or supermoto frame and make mine purple. Now where did I put my old Denco catalog??? I hate it… it has that Transformers looking headlight, ugly exhausts, cheap looking components and is painted a color that is trying to take your attention off the poorly executed lines and curves. Oh wait, I haven’t seen it yet…… but still, I might feel exactly like that. Ha, i was thinking same thing… might have the coolest motor(turbo hopefully), but it is probably too ugly or uncomfortable to buy. Bring back the UJM . Maybe it’ll have a huge, knobby tire on the back…..that’ll change the landscape? That will burn even more oil. Lol. Hope they get it to handle better than the old two strokers because they were like riding a wooden telegraph pole with wheels. Worst handling bikes I’ve ever ridden and they were DEATH machines, killing people wherever they were sold. Combining other guesses, I hope it is a 3-cylinder, direct injected 2-stroke of at least 750cc. That would not require the weight or complexity of forced induction to have some great streetable power. If it is a four stroke, it would have to be forced induction to “forever change the landscape”. I just hope it isn’t over-styled like a melted hunk of plastic! Supercharged or not, the question is what is going to be the price range. I bet it will be in the Panigale price range. Will be a 600cc forced induction engine, will be the same size and weight as a normal ZX6R but produce 1000cc power but loads more grunt down low in the rev range. Just heard the sound clip of it. Definitely a turbo charged inline 4 cylinder. Revs pretty fast and high so probably a small displacement 600cc motor. It should perform about as well as a current ZX10R. I know.. it’s a 30cc inline 4 with 33 valves that will run on it’s own exhaust to operate a generator that will run an electric motor, while it’s controls are solar powered. It will cost 87 thousand dollars and no one will buy it. End of story. That “teaser” video reminds me of Kawasaki’s advertising campaign for the KZ650, showing nothing but a woodden crate, but claiming performance yet unseen. That’s the same year two stroke building Suzuki came out with the GS750 four stroke that soundly trounced the Kawi in every regard. Here is hoping, for Kawasaki’s sake, that history doesn’t repeat itself. Oh no, not more styling that’s “sugomi-inspired” (isn’t that oxymoronic? ),ruining an otherwise good motor. Didn’t Yamaha make a similar claim in it’s awful “wait till you see our darkside!” ads for the FZ-09? This bike better get 100mpg with 100hp or brew beer if it plans on changing landscapes. My very first motorcycle in 1973 was a Kawi H1 500 two stroke triple – that bike forever changed my bowel movements. … it was that very first one – the white tanked 1969 model that I ejected my passenger George from with a nice quick blip of the thrittle in first gear. I’m glad is feet were running fast before he made contact with the street. Sorry George. Same here! 16 years old! what was my Dad thinking when he let me buy it from my brother. Unsafe at any speed but it sure was fun. Don’t know how I survived. Got a RD350 after that because I liked the idea of being able to stop and go around corners. If you’re still able to use a bathroom all by yourself after owning one of those, ya’ done good. Ya’ done real good. The line drawings showing its layout say it’s a four-stroke. Of course it’s going to be a 4stroke – is anybody seriously thinking about 2strokes?! There’s been a few rumors lately about Kawasaki working on a supercharged engine. I don’t think it’s going to be a 1000cc inline four, that would be too big, too heavy, too powerful. But a supercharged 750cc triple could be compact and lightweight and crank out around 150 hp – that would change the landscape some! LOL forever is a Looooong time. It’s like saying it’s the “ultimate”. Ever heard that one before? another bike the local shop mechanic will have no inkling how to diagnose or fix, just like the Suzuki Rotary and the Japanese turbos of the 80’s, which were supposedly going to change the motorcycle landscape forever as well. Only history will tell if Kawasaki’s bike will alter the landscape of motorcycling. Kawasaki service technicians are already doing maintenance on 4 cylinder supercharged engines in personal watercraft. I doubt putting a similar engine in a motorcycle with baffle them too much. Last year,Kawasaki announced they were developing a supercharged four-cylinder. I would expect that to be the case here. I agree, a supercharged triple or four cylinder. Well, well. Using the H2 name would imply three cylinder 2-stroke 750. In My dreams, I guess.